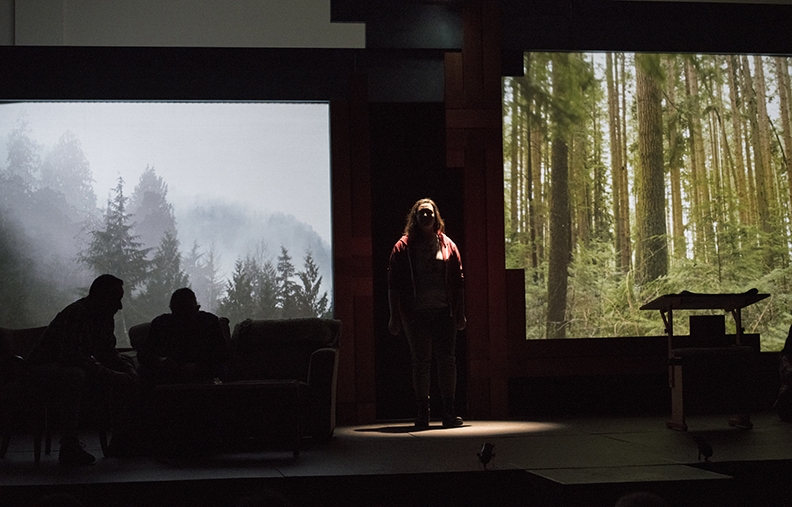 The title of this production, šxʷʔam̓ət, is based on a hən̓q̓əmin̓əm̓ (a local Indigenous dialect) word used to reference home. This word has so many different meanings to all of us who are living on this land. The following is a pronunciation guide to facilitate your engagement with hən̓q̓əmin̓əm̓. Content developed courtesy Musqueam Language and Culture Department 2017.
šxʷʔam̓ət: š is pronounced like English “sh”. xʷ sounds like the “wh” in “which” (as opposed to the “w” in “witch”). Stress is on the first syllable, like in the name “Amit”. ʔam̓ sounds like the first syllable in the word “omelet”. ət sounds like the second syllable of the word “comet”. 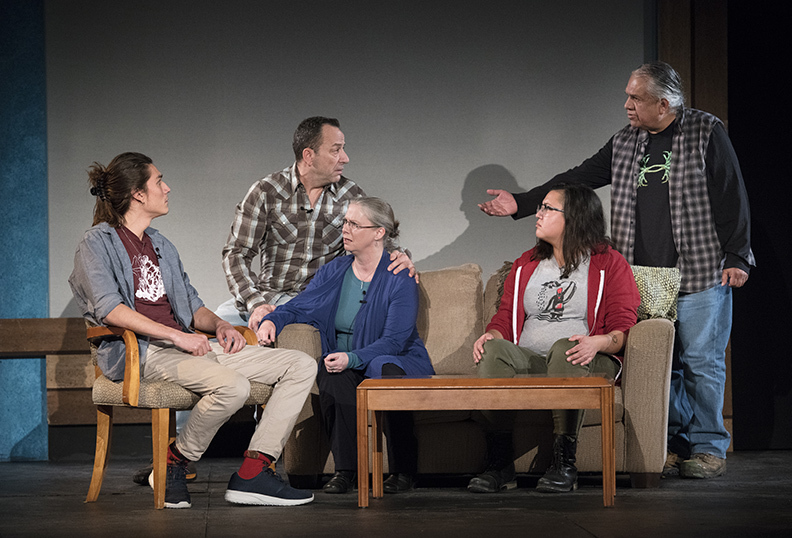 Provocative and entertaining, this production is created and performed by an Indigenous and non-Indigenous cast, and asks us to imagine what reconciliation really means. If you want innovative theatre that is engaging and challenges your perceptions, this would be it. 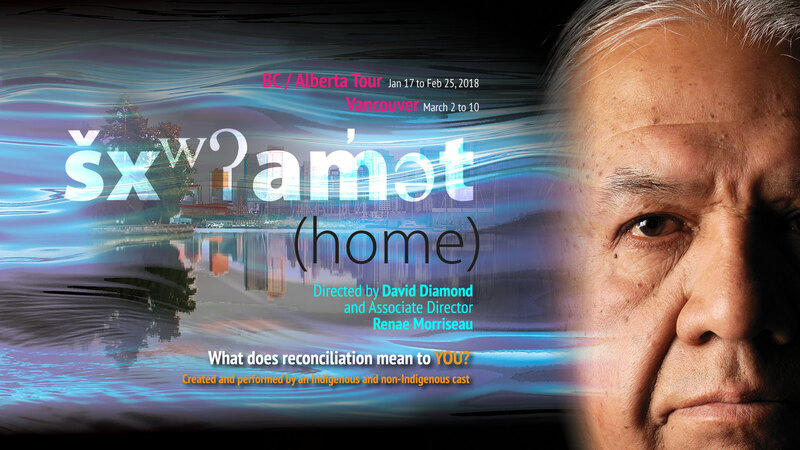 We are very excited to be touring šxʷʔam̓ət (home) into 21 communities across BC and Alberta and then returning home for 9 final performances at the Firehall Arts Centre in Vancouver. Why tour? 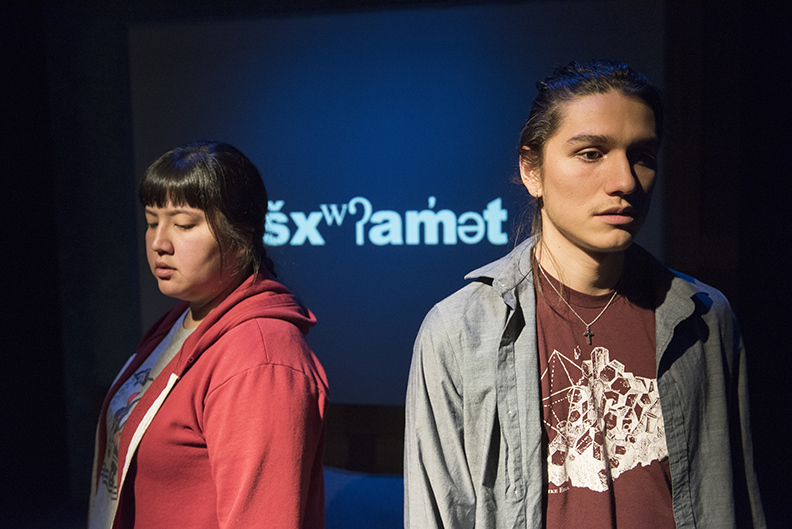 First, šxʷʔam̓ət (home) is terrific theatre. The public response to this project was very powerful. We played to 91% houses and started getting invitations from communities while we were still doing the first run in March of 2017. We also feel that šxʷʔam̓ət (home) asks very important questions about how we navigate Reconciliation between Indigenous and non-Indigenous communities in Canada in true and honourable ways that do not replicate colonial ways of the past and present. If you are in or near any of the 21 BC/Alberta communities we are visiting, or in Vancouver, please join us. Detailed information can be found here. Thank you for taking the time to organize and share space to dialogue about šxʷʔam̓ət (home) in your community. 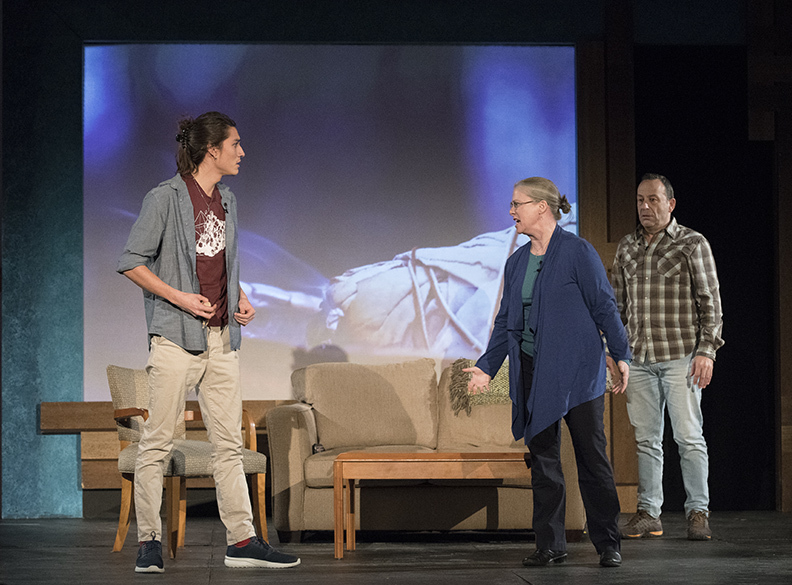 We know the play was packed with many layers of issues and barriers towards reconciliation, and we raise our hands to you for having the courage to take these issues to heart and into the community. At the heart of this document and this production is community building and relationships. We hope these materials will be helpful as you go about this work. You know your community, so if you feel some pieces may work and some not, then adapt, change, rewrite - whatever you think is best! The Dialogue Guide includes planning and facilitation tips, an outline for a dialogue gathering, and resources. This basic guide contains suggestions that could be adapted for small, informal groups and individual reflection. → Detailed Dialogue Guide - Provides more detailed descriptions of the dialogue gathering (in case you want ideas of what could be said or how to lead activities). → Follow Up - Ideas to stimulate participants’ creativity. It also includes a few Success Stories of how Indigenous peoples, those who ancestors were settlers, and more recent newcomers have been working together toward truth, healing and reconciliation. → Further Resources - For future learning: going towards action; resources for children and youth; written resources; videos and films; websites; podcasts; municipal initiatives. → Photos - from the play to download and project to remind participants of attending the performance. Click here to access the public google drive folder. Michael Harris, of the Gitxsan Nation. Meredith Martin, of Coast Salish Ancestry from the Snuneymuxw Nation (Nanaimo). Meg Roberts, whose ancestors from England, Wales, Sweden and Norway were settlers in Saskatchewan. To share feedback about your experience using any of these Play Dialogue Guides, please email Meg Roberts at mroberts@uuma.org and/or David Ng, Theatre for Living Outreach Coordinator at outreach@theatreforliving.com. You can also learn more about Reconciliation efforts and how you can get involved. Where are the Children? An interactive website about Residential schools, with an online guide, and interactive timeline. The Indian Residential Schools Crisis Line (1-866-925-4419) is available 24 hours a day for anyone experiencing pain or distress as a result of his or her residential school experience. Indian Residential School Survivors Society The Indian Residential School Survivor Society (IRSSS) is a provincial organization with a twenty year history of providing services to Indian Residential School Survivors. They can provide workshops to any groups teaching about Colonization, History and the impacts of Indian Residential Schools. Chinatown Action Group An inter-generational group of progressive, left, Chinese organizing for social justice in Vancouver, that does solidarity work. Sisters Speak (program of the Vancouver Aboriginal Policing Centre) Sisters Speak is a project to share knowledge with young First Nations women and girls who are at-risk of being exploited in Vancouver’s Eastside and school systems. Idle No More Idle No More calls on all people to join in a peaceful revolution, to honour Indigenous sovereignty, and to protect the land and water. The Sacred Trust The Sacred Trust is an initiative of the Tsleil-Waututh Nation mandated to stop the Kinder Morgan Trans Mountain pipeline and tanker project. Journeys Around the Circle Society (find them on Facebook) Join Journeys Around the Circle for weekly circles and activities with Residential School Survivors and other Elders. The Vancouver Public Library Aboriginal Storyteller in Residence Program The VPL hosts an Aboriginal Storyteller who shares stories at a number of different events throughout the year. šxʷʔam̓ət (home), left to right: Madeline Terbasket as Siya and Asivak Koostachin as Lucas. šxʷʔam̓ət (home), left to right: Mutya Macatumpag as Chase and Madeline Terbasket as Siya. Back row: Mutya Macatumpag, Joey Lespérance*, Rev. Margaret Roberts*, Sam Seward (Squamish/Snuneymuxw). Front row: Madeline Terbasket (Okanagan, Ho-Cak & Anishnabe), Asivak Koostachin (Inuk/Cree)*, Nayden Palosaari (Cree). Support Person is Harriet Prince (Ojibway and Sagkeeng). *Appear through the generous support of Canadian Actors’ Equity Association. šxʷʔam̓ət (home) is back due to popular demand! 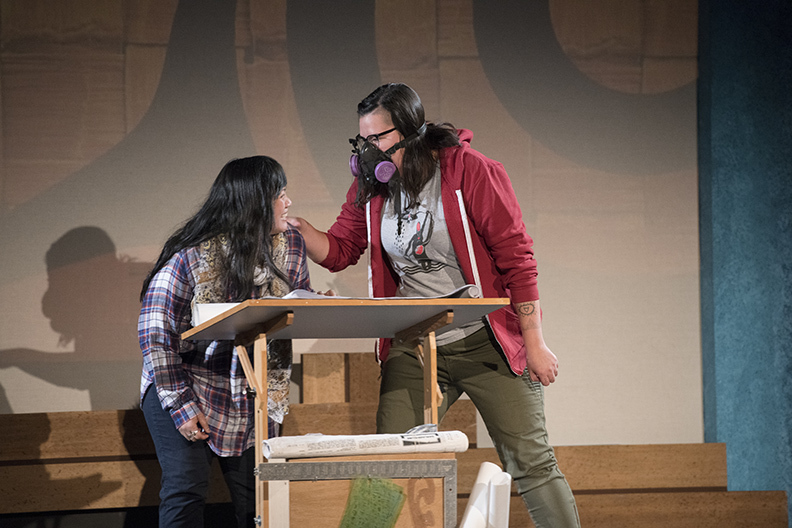 The original play was workshopped by a courageous group of Indigenous and non-Indigenous community members and then created and performed by a cast of seven original and relevant voices, from a diverse range of Canadian society. Special acknowledgement to: Sam Bob who originated the role of Joe and to Tom Scholte who originated the role of Doug (now Robert). Neither cast member could tour. 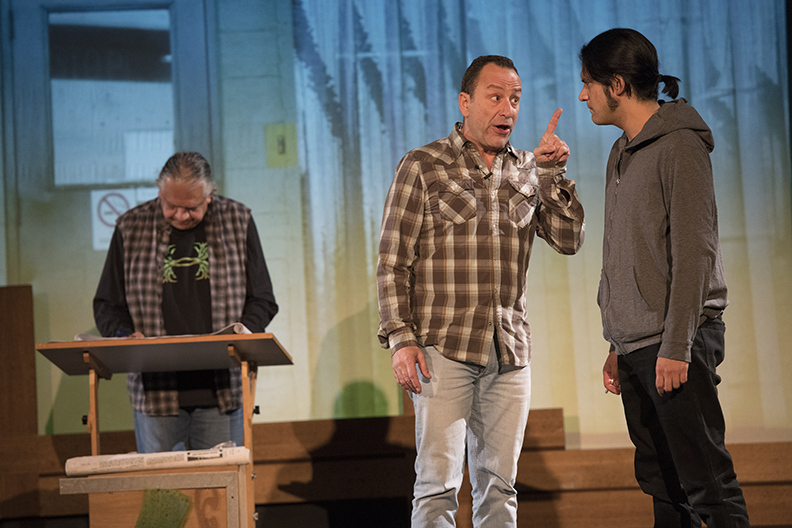 The Director of šxʷʔam̓ət (home) is David Diamond, recipient of the Otto René Castillo Award for Political Theatre in NY (2010) and the Mayor’s Arts Award for Community Engaged Art (2012) as well as numerous other awards. The Associate Director is Renae Morriseau* (Cree and Saulteaux), originally from Winnipeg, Manitoba. She works across Canada and the US in theatre, film, television and music. Among numerous honours, Renae was the recipient of the 2015 Mayor’s Arts Award for her work to cultivate social justice and inclusiveness through theatre and music. 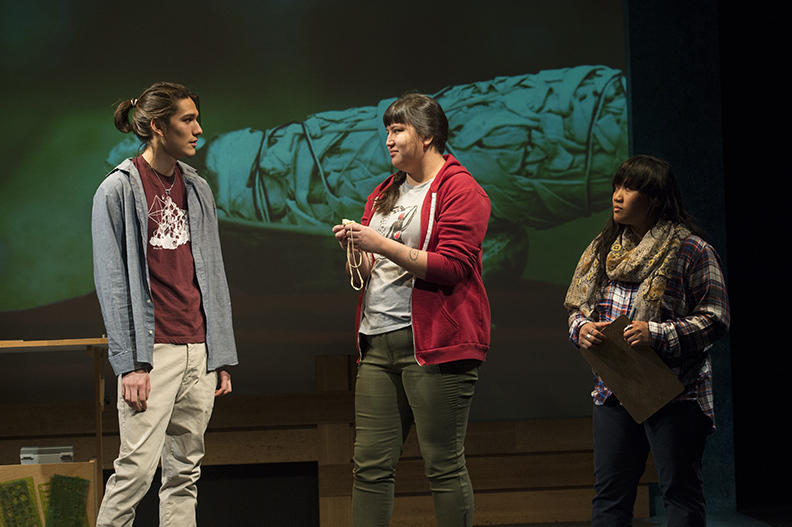 They lead a talented, multi award-winning design and technical team including: Technical Director Tim Cardinal (Cree), Stage Manager Dorothy Jenkins*, Set/Props Designer Carolyn Rapanos, Video Designer Bracken Hanuse Corlett (Wuikinuxv and Klahoose), Lighting Designer Alan Brodie, Sound Designer Clayton Gianni Charleyboy (Tsilhqot'in), Costume Designer Carmen Alatorre (original costumes) and Jessica Oostergo (tour costumes), Webcast Master Chris Bouris, Tele/webcast Director Michael P. Keeping.